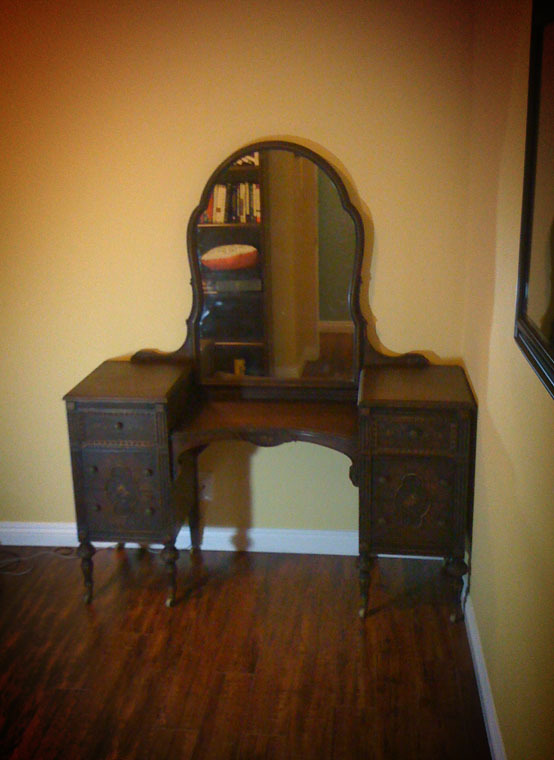 This is our newest edition to the house: a Sligh Furniture Co. 1920’s/30’s era vanity for my wife for Christmas. I have to confess that this came from an antique store. I’ve never strayed from thrift stores and good old fashioned hand-me-downs/garbage rescues in all my years but in 2010 my loyalties was a little loose. This piece was so beautiful, desperately needed and was priced so good (and my wife bargains so well) that we practically stole it. It needed just a small bit of structural repair (all on the back, thank goodness) and wa-la. PS – this yellow color on the walls was picked by my wife and it’s my favorite color in the entire house.